Hershey make Cadbury's Dairy Milk under licence in America. 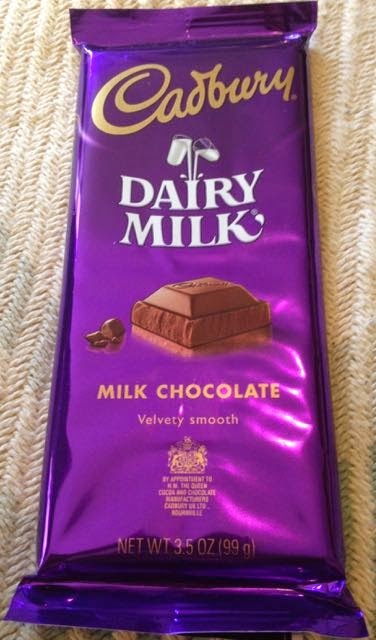 Recently the USA has stopped the commercial importation of Cadbury's Dairy Milk. Meaning that this American Hershey's made version is the only Cadbury's Dairy Milk available in the USA. A friend of the blog brought one back for me to try to see if I could decide whether the USA is missing out on one of my favourite chocolate bars or if they'll be okay! Half of the people in Cinabar's office couldn't tell the difference when tasting a separate bar, and the other half could, but weren't that fussed with the difference. Having said that, one person didn't like it at all, and another preferred it. On the back of the bar there is a brief history of Cadbury, which delighted us as UK Cabury's bars don't have the history on theirs, presumably Cadbury's presume we already know... The Hershey's Cadbury's Dairy Milk bar has the royal warrant twice on the packet, but I don't know whether the Queen prefers it or not or even reads this blog. If she does, can I have a knighthood please? Anyway, Cinabar thought that this bar is less sweet than the UK Cadbury's Dairy Milk with a slightly bitter aftertaste. She thought it was not a bad bar, but it just isn't Cadbury's! Personally I thought the bar smells just like Cabury's Dairy Milk. Yes, I smelt it. I'm a professional (LOL). The square pieces within the slab of chocolate were not rounded like the UK version and seemed more traditional in design. I could see what Cinabar meant by a slight bitterness, it initially tasted a bit like a Cadbury's Twirl, which is one of my favourite bars. The more I ate the bitterness grew and lingered a little more in the aftertaste. Still I liked this chocolate bar even if it's not completely like Cadbury's Dairy Milk, but I can see why some in the USA are craving the proper Cadbury's Dairy Milk experience.